Statement of information is located at https://s3-ap-southeast-2.amazonaws.com/zenu/LISTING_IMAGES/334-667141/mr6zlw18pnd567l6fl8d52tz0vvbs6f9.pdf . Please copy & paste this information into your browser address bar. Discreetly located in a quiet street in the heart of South Yarra united by the shopping and dining precincts of Toorak Road and Chapel Street, this unique 320sqm (approx.) four bedroom four bathroom contemporary warehouse is the quintessence of New York loft living with exciting potential to further enhance. Gallery inspired art walls, graciously scaled living areas, soaring ceilings, polished concrete flooring, the warmth of timber and a series of private north-facing terraces provide a dynamic architectural framework for residential living, commercial enterprises or a combination of both (STCA). Rising over four levels, the multi-functional floorplan is a stage for both large scale entertaining and intimate daily living and features a marble kitchen with Gaggenau appliances and vast open plan living with an open fireplace, balcony overlooking South Yarra and floor-to-ceiling windows sliding open to a northern decked entertaining terrace. Cleverly zoned to privately accommodate family or guests, four bedrooms and four marble finished bathrooms include the decadent master suite that commands the entire top floor with a north-facing lounge area opening to a terrace above an atrium and marble ensuite with freestanding bath. 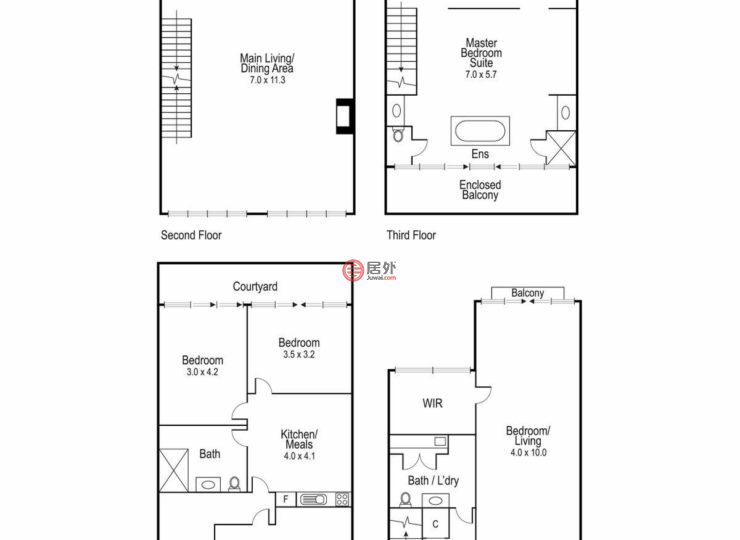 A lower-level kitchenette and meals area services two further bedrooms or potential office spaces, while the third bedroom suite is contained in a private wing with its own living area. A double remote garage, hydronic heating, internal hanging gardens, polished floorboards and an outdoor shower further enhance the amazing lifestyle experience that this warehouse provides. Use the existing renders, including a rooftop pool, for inspiration to take this exhilarating abode to the next level (STCA) or consider bringing your commercial venture to life in this dream location. Tucked in behind the corner of Toorak Road and Chapel Street, the most iconic cross section in the city on the doorstep of hundreds of cafes, restaurants and shops, you can walk to everything South Yarra and surroundings have to offer including Prahran Market, Como cinema, Fawkner Park, The Yarra River, trams and South Yarra station for a quick commute to the CBD.